This caster was designed for medium use in a double ball construction. The main feature is the optional "Total Lock Brake" system which allows the swivel and wheel to be locked at the same time by merely stepping on the pedal. To release simply kick brake. Head seals and zinc plating are standard. 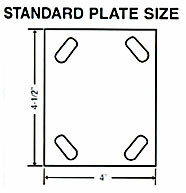 Top plate size 3-3/8" x 4-1/8"
Bolt hole spacing 2-3/8" x 3-1/4"
slotted: Mounting bolt hole 5/16". Total lock brakes, add suffix TLB after model number (Swivel only). The Swivel Plate Caster of the 3100 Series is designed for quiet, easy swivelling and will take the abuse of rough, continuous service. The superior construction of these casters enables them to be used effectively on containers, dollies and trucks. This Caster finds extensive use in industrial plants, warehouses, institutions, department stores and in numerous other applications that require smooth mobility beneath a heavy load. Its double-ball race and sturdy construction are features that promise many years of dependable industrial use. Cross-section illustrates design of generously proportioned upper and lower ball races riding on 5/16" and 1/4" diameter balls respectively.